This painting is one of the biggest projects I've worked on. In 2010 Pope Benedict XVI made his first Papal state visit to the UK- and one of his reasons for being in the country was the beatification of Cardinal John Henry Newman. Cardinal Newman is an important figure to thousands of people around the world and there are many people praying and campaining for him to be canonised. I soon learned it was also a personal cause of the new Pope, which is one of the reasons I chose this composition. It represents a spiritual meeting of sorts between the two against the backdrop of the Oratory at Birmingham (which Cardinal Newman helped found) and I thought it might bring The Pope some joy seeing himself connected in this way to Cardinal Newman's legacy. The painting includes elements of gold leaf which you may be able to see in the close up & their respective coats of arms are included in the corners of the border. I am told that when Pope Benedict was shown the painting he described it as 'Wonderful' and the Vatican website coverage of the trip includes several of photographs of The Pope looking at my painting with a smile on his face. It was printed on the cover of the prayer sheet for the mass (which every last person took home with them). Subsequently I have been lucky enough to have a couple of articles written about the painting printed in a worldwide Catholic publication, after which I have received both kind words and requests for prints. 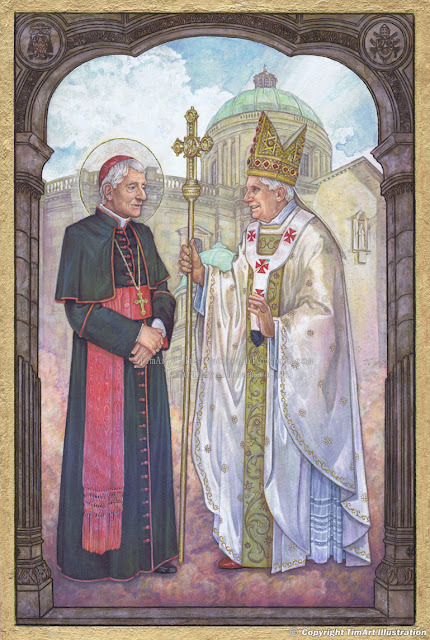 The original now hangs in The Oratory and Pope Benedict took a print home with him, for which I recieved a letter from The Vatican (on special Vatican paper!) thanking me. I owe a lot to the man who commissioned this painting and thought of the whole venture, & to all the people who have been incredibly kind and generous to me throughout. Its not often you get the chance to do work that means something to people. Images uploaded to this blog are copyright TimArt works. Do not use without permission. Simple theme. Powered by Blogger.